MOM’s Organic Market got its start in 1987 as a home delivery service operating out of our founder and CEO Scott Nash’s mother’s garage. 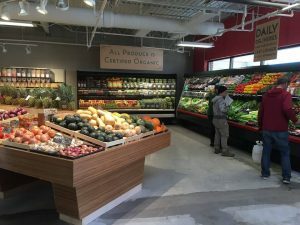 In nearly three decades since, we have expanded to four states and Washington, DC, specializing in selling only certified organic produce and stocking a higher percentage of organic items than other major grocery chains. MOM’s purpose is to protect and restore the environment and, to support this aim, we’ve been committed to 100% renewable energy power since 2005. 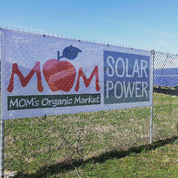 MOM’s uses a variety of renewables to support this goal, including utilizing a combination of both on-site and off-site solar power PV systems and purchasing 100% American Wind Renewable Energy Certificates (RECs). Being an environmentally friendly company not only helps the world to be a better place, it also helps our business’s bottom line by increasing employee morale and customer loyalty. 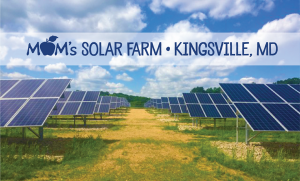 With expanding options for solar, we hope other businesses follow suit!